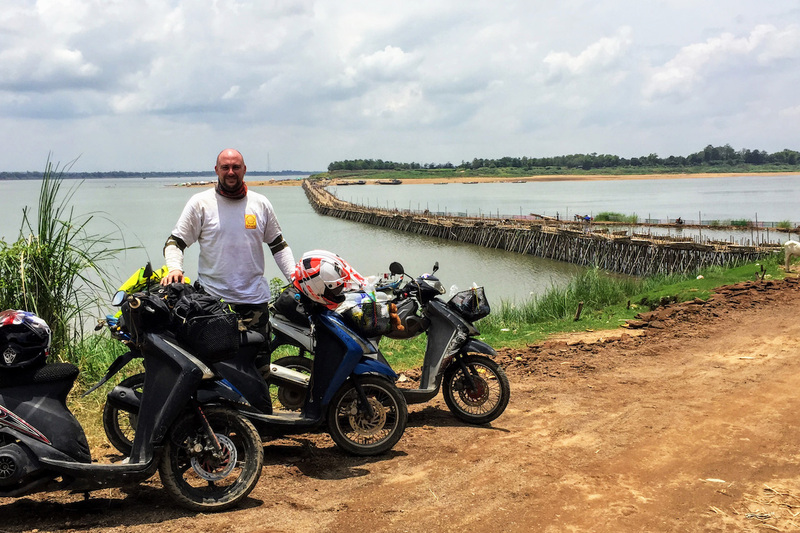 It’s March 2017, the planning phase was over, and with a mixture of excitement and trepidation my mate Ryan and I hopped on a train from Sheffield to St Pancras, the first leg of a 20hr journey to get to Cambodia, for a Top Gear inspired bike adventure. We met up with trip organiser Dave C, and our fellow journeymen at Heathrow airport. We were a group of 8 Brits, plus an American adventurer code name ‘Buck’ due to meet us in Cambodia. 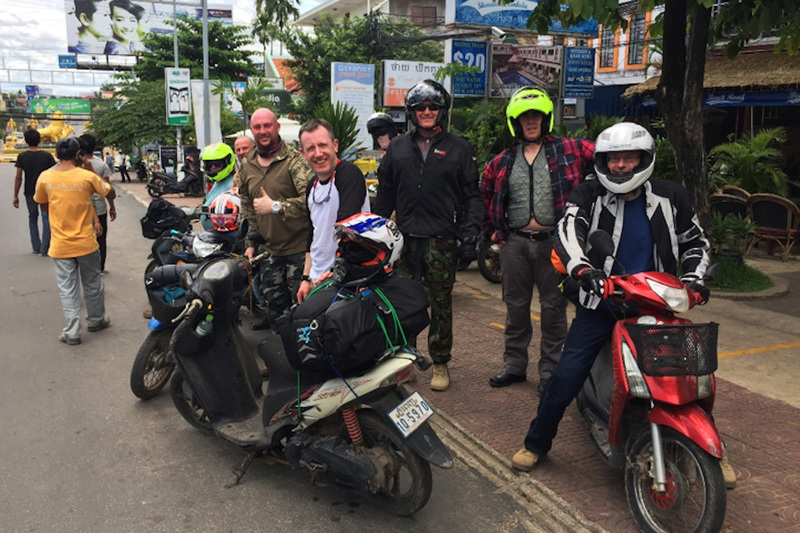 Dave C had already arranged three similar trips previously, two to Vietnam, and one to Laos, so I was confident we were in safe hands. Plus many of the other guys had been on some or all of the previous trips so we are surrounded by experience. 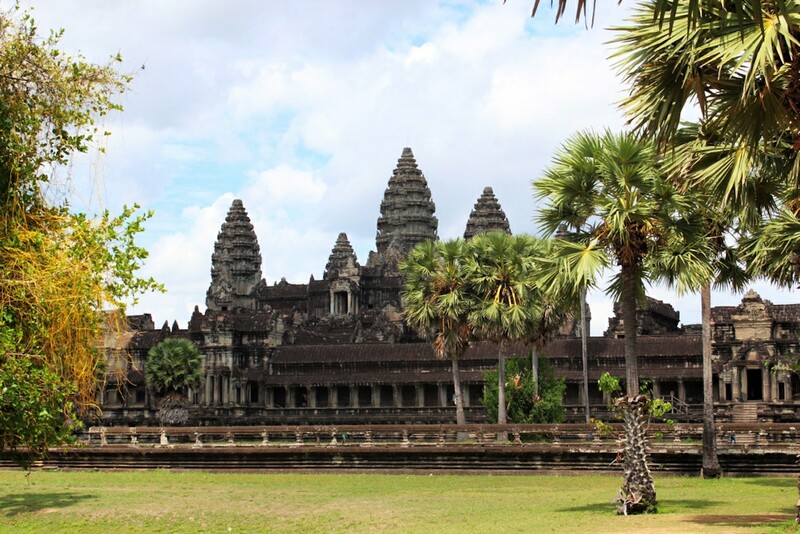 With budget in mind, our travel route saw us fly from LHR to Cairo, then to Bangkok, with a final short hop internal flight to Phnom Penh the capital of Cambodia. Our first 2 flights were with Egypt air, at a cost of about £500, but be warned, Egypt air is a dry airline…. So if you like a ‘frosty beer’ (or four) when you fly, I’d book an alternative airline. We leave Phnom Penh airport and get a couple of Tuk Tuk’s to the Zing Hotel, our digs for the first night. 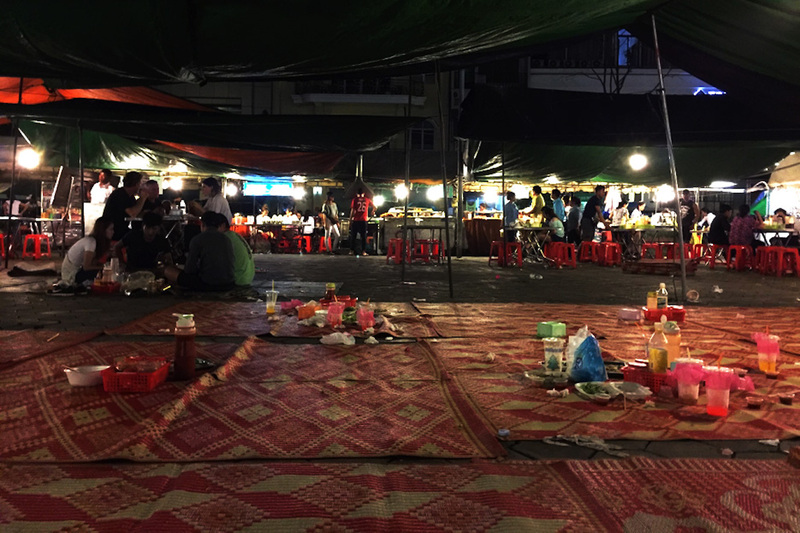 The first night in Phnom Penh involved some epic street food, eaten sat on mats on the market floor. In Cambodia it’s rude to point the soles of your feet at anyone, being mindful of this while eating sat on the floor is harder than you might think… We won’t meet our trusty (or not so trusty in some cases) steed’s for a couple of days yet, as they are in storage with a contact of Dave C’s in Sihanoukville on the South West Coast. For our trip the bikes had all been purchased in advanced, rather than hired, at a cost of about £300pp. On our first full day in Cambodia we caught the slow train all the way from the Phnom Penh, South West to Sihanoukville province, to collect our bikes (or scooter, depending on which keys were randomly selected). The adventure could then finally hit the tarmac / dirt / gravel / sand. I selected a black Toyota key, which actually belonged to a blue Suzuki Step scooter (Yes, I was as confused as you are…). It seemed only right to give my ride for the next 10 days a name, so she quickly became affectionately known as Brenda. Having selected our bikes and had a quick trial ride around the block, we were off. Ahead of us awaitied 1200km of riding highs, riding lows, and most frustratingly – breakdowns. 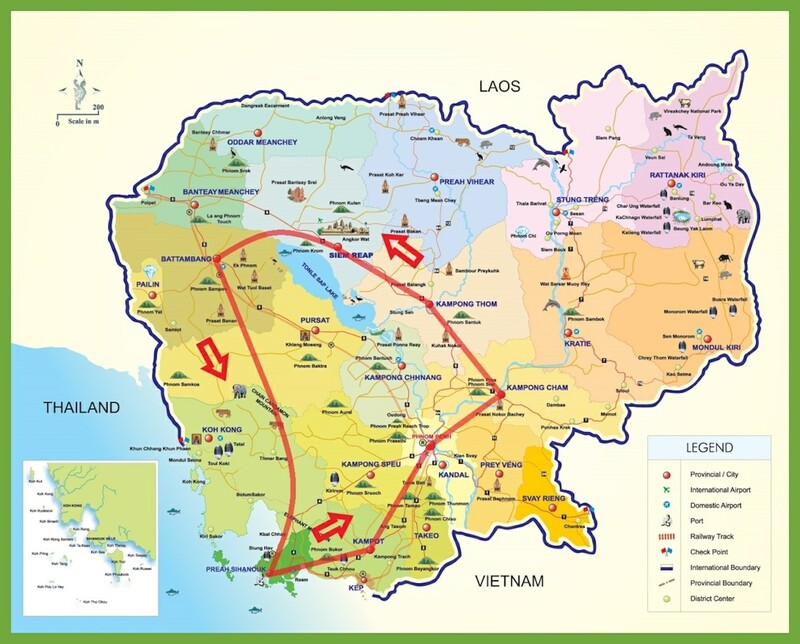 Our rough route would see us completing an anti-clockwise loop of the Tonlé Sap, a large lake in the centre of Cambodia. 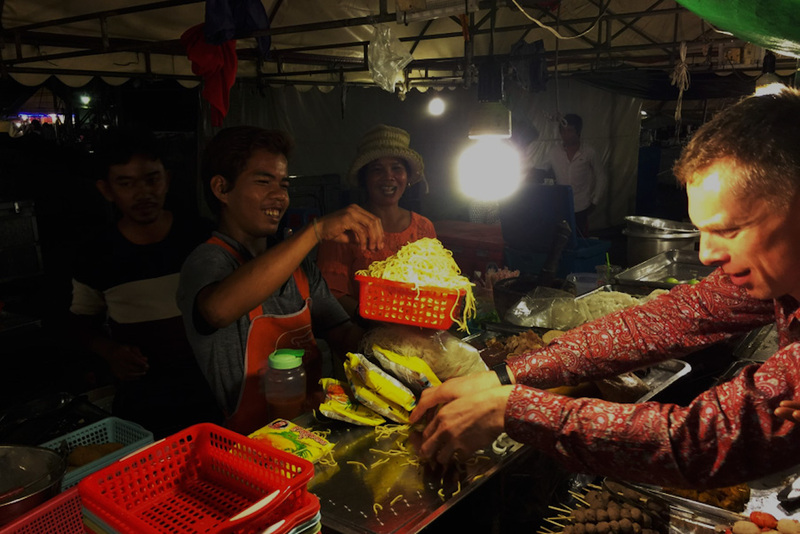 Our trip on the bikes would take in Sihanoukville, Kampot, Phnom Penh, Kampong Cham, Kampong Thom, Siem Reap, Battambang, Veal Veaeng, and with a bit of luck all the bikes would make it back to Sihanoukville… (They didn’t). I should make it clear at this point that I massively advocate visiting Cambodia to experience the roads, the scenery and most importantly the people. However, it would be remiss of me not to describe the standard driving we encountered during our trip. I want to try and describe what it’s like being a motorist from the UK in Cambodia, and in particular heading out riding the bike (Scooter). The best way I can describe it is there are some rules of the road, which everyone is clearly aware of, and you will usually see plenty of people adhering to them. Traffic lights, roundabouts, and lanes all exist, although of course like the majority of the world Cambodians drive on the right…. well most of them. However, there are some ‘rogue’ road users who seem to follow no rules (or common sense for that matter) whatsoever, they zip around, take on unbelievable undertakes or just wander into the road doing whatever they want. I use the term ‘rogue road users’ rather than motorists, as you have to include in this (but not exclusively) scooters, cars, trucks, dogs, chickens, and in particular buffalo!!! Within hours of setting off riding we experienced the Cambodian Police for the first (and thankfully the last) time. 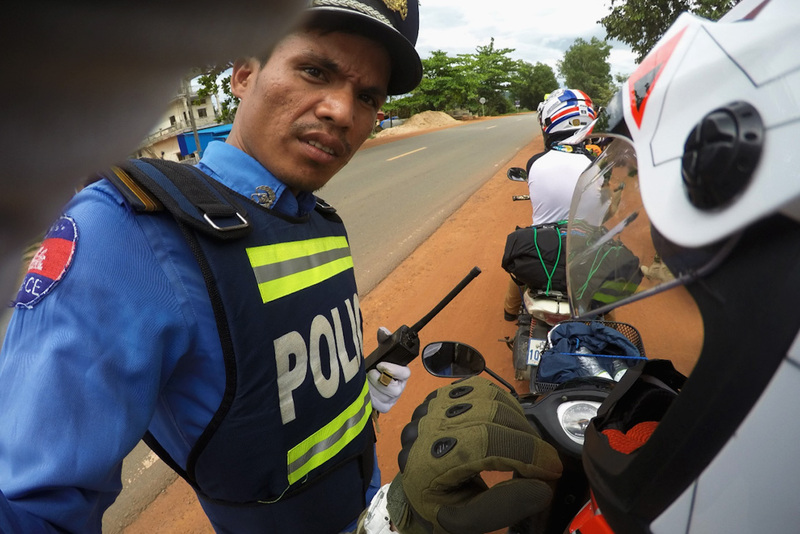 It was a speed check site, and while the bikes were barely quick enough to break any laws, two of them were registered in Vietnam rather than Cambodia, which gave the officer all the excuse he needed to issue 2 fines. When I say ‘fine’ in reality ‘bribe’ would be more accurate. The officer started at $50 U.S. each, but eventually $10 per bike was agreed. Thankfully this was the only time we encountered this, despite seeing many Police officers during the remainder of the trip. Ironically, my Go Pro wasn’t recording when we were stopped, however the officer took a dislike to it being switched on, and in his efforts to switch it off, managed to take his own selfie! Part of the challenge and experience of my trip to Cambodia was simply overcoming the mechanical issues. The exhaust on my scooter failed a couple of times, detaching from the engine underneath the scooter. This needed a couple of bodge jobs early on, but ultimately cost about 4 hours’ worth of repairs on our third day of riding, but got sufficiently sorted to get me all the way to the end of the trip over a week later. Unfortunately however Ryan’s ride, also a Suzuki Step, was basically a sack of sh*t on 2 wheels. It was junk. On the second full day of the trip it broke down in epic fashion, and led to us having to complete the day and 70km in the back of a bone shuddering waggon. I’m not sure my spine has ever been the same since. Dave C even bought ‘her’ a bunch of plastic flowers at one point to try and woo her into behaving. They didn’t work. The fortunate thing in Cambodia is that whenever something went wrong, anyone you encounter will do their best to help you. Could you imagine breaking down somewhere, your mobile phone is useless, but before you can even start asking for help, people are leaving their homes to come and do what they can to assist. That’s what riding around Cambodia was like. I suspect anyone reading this with knowledge of Cambodia’s history may wonder if we visited the Killing Fields. Unfortunately whilst some of the group did visit Choeung Ek, Ryan and I didn’t make it. However, what I can say is that I certainly saw the effect that going had on my fellow travellers when we caught back up with one another. It is certainly hard to comprehend that such a beautiful country, with such amazing and wonderful people, could have experienced the genocide of over 1 million people between 1975 and 1979. 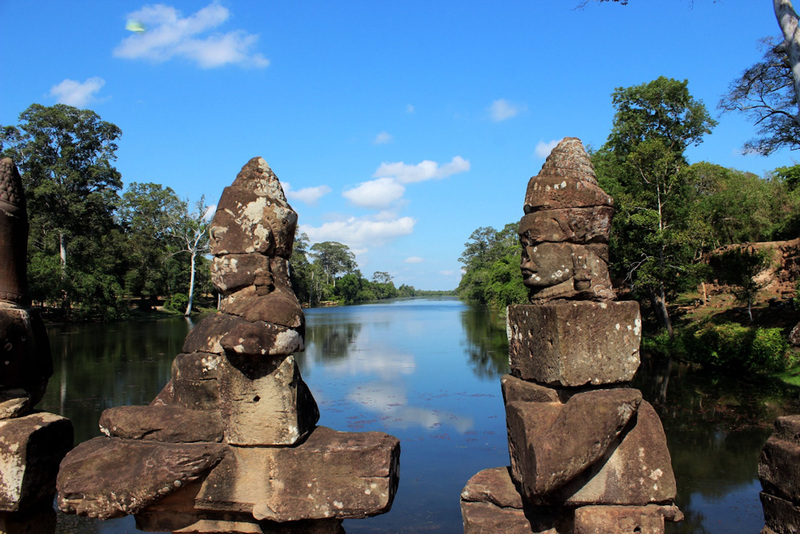 Thankfully we did however make it to the Angkor Wat temple complex in Siem Reap, a must see for anyone visiting Cambodia. It is the world’s largest religious monument and dates back to the 12th century. Most of you will probably know the temples from the Tomb Raider movie. We paid for an organised trip which was definitely the best way to do it and cost around $30 each. A particular stand out day was when we made our way to Veal Veaeng, an extremely small village in Western Cambodia in the Pursat Province, and the shadow of the Cardamom mountains. This day basically involved over 100km of off road riding on a mixture of loose dirt and sand, right through to deep mud, flooded paths and two river crossings. The terrain that day would have challenged a KTM or a Honda off-roader, so to make it on fake Honda Wins and shopping scooters was somewhat of an achievement. Having overcome the jungle and made it to Veal Veaeng, we were all ready for a good meal. I have to say the majority of the cuisine we ate, whether in a hotel, or in the middle of nowhere was usually of excellent standard. 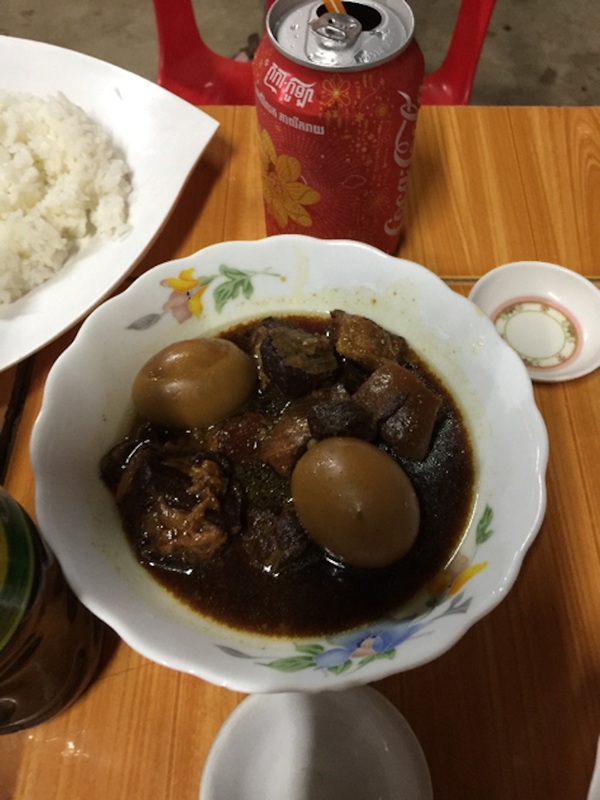 Unfortunately, the evening we arrived in Veal Veaeng, despite being met as always with big smiles and interest from local villagers, the food was somewhat of a challenge…. 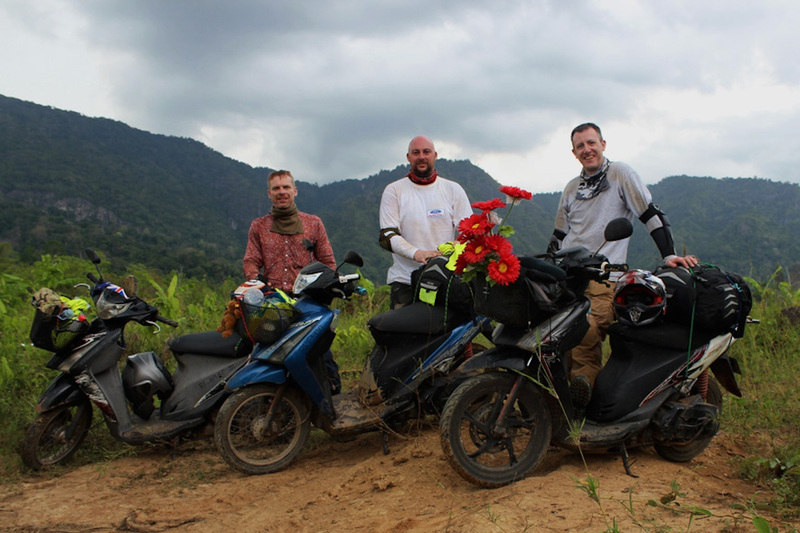 As we reached the latter stages of our trip, the distance, the heat and in particular the terrain was starting to take its toll on the bikes, and unfortunately two the other Suzukis involved were really struggling and didn’t quite make it back to the Hotel at Sihanoukville. Thankfully both Ryan and I made it. 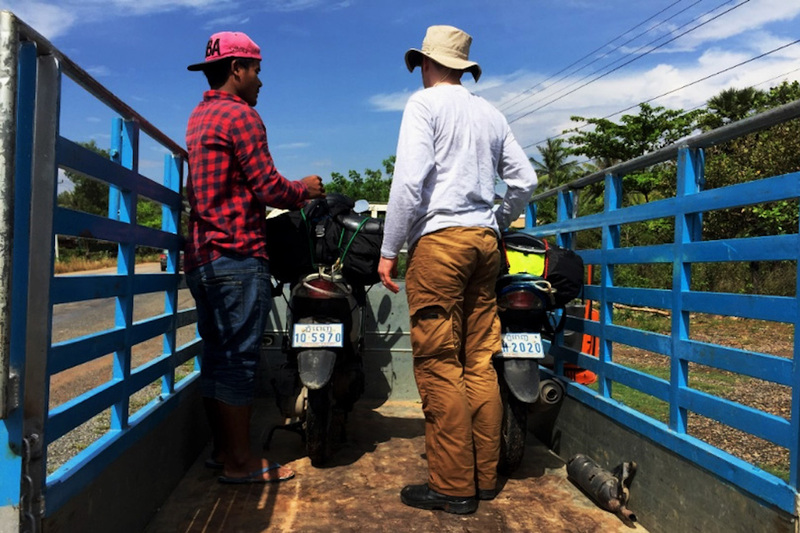 This was partially due to determination, somewhat due to a willingness to throw a couple of hundred dollars at Ryan’s bike to keep it going, but definitely down to the help and assistance we received from the Cambodians we met on the road. The following morning we gave the bikes back to Andy Mac, who was to sell them on for whatever he could get, given the punishment we had given them. Any money raised was to be donated to charity. I don’t mind saying that it was hard to say goodbye and leave Brenda behind, I understand now why Richard Hammond shipped his Opal all the way back from Africa after one of the Top Gear Specials. That was it, apart from a lot of flying, and an 8hr layover in Bangkok, the adventure was complete. As I stated in the title this was not a holiday, it was way too hard to be considered that, it was an adventure. Although, I must confess that 3 of us did book into a beautiful hotel in Siem Reap for two nights mid trip just for a re-charge …, it had to be done. website set up by Dave C.
My next blog will be in April and will detail a 5 day trip to do the North Coast 500 in Scotland.